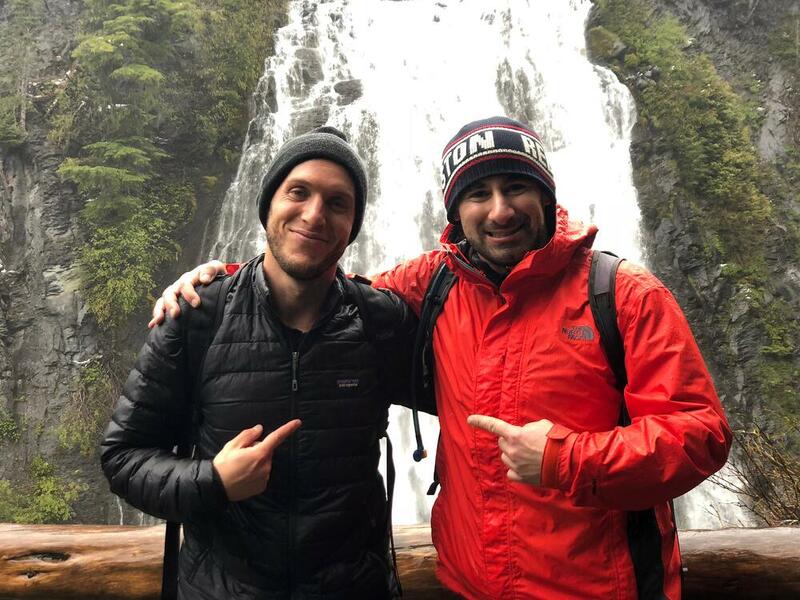 Highlights from this month include climbing down to a magical waterfall in Washington, witnessing the beauty of Mt. Hood, visiting family and friends, and working on some really big projects for Wild We Wander. Overview: Just west of Seattle, you can access Bremerton easily by ferry. If you ever find yourself on this side, we have a few recommendations! Where we camped: We tried to stay in Ariele's mom's apartment, but her cat is insane and hated our presence with a passion. We slept covertly in our little home in her parking lot. Funny side story: We came back from a weekend away and saw that the Airstream was off its blocks and the chalks had flown away. We thought someone had messed with us, but it turns out that the pavement was so slippery and we were at such an angle, the pressure was too much and the blocks flew out from under poor Dot. We figured that out because it happened again. Overview: The Washington coast is a mystical dream. And not just because Ariele is a Twilight fan. The area was unlike anything we'd experienced. TBH, Forks could be missed, but is a good central location to visit the park and beaches. 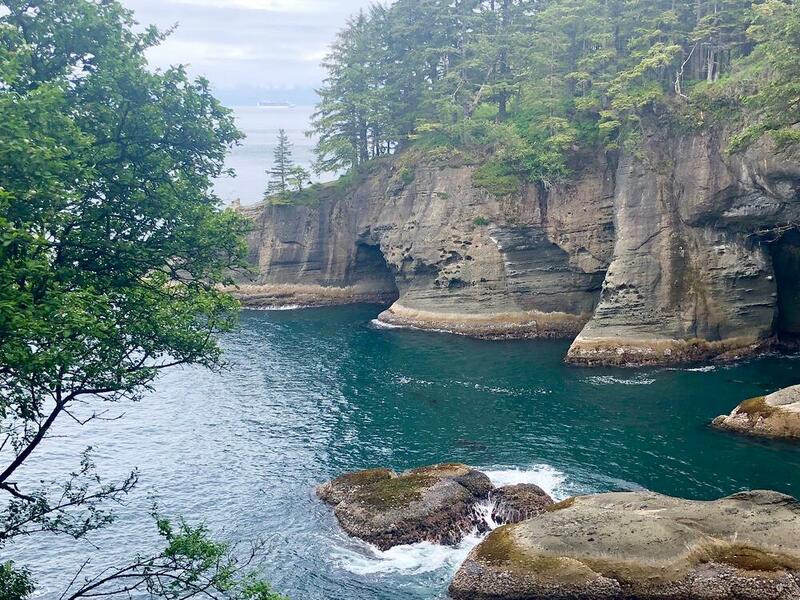 Go to Cape Flattery, the most northwestern point in the continental U.S. Visiting felt like a spiritual journey. We walked through an old forest for about a mile until we came to rocky cliffs the ocean was pounding against. The water was a mystical teal in which we saw a sea lion playing in the waves. Then, look at a map and realize exactly where you are in that moment. Wow. Where we camped: Because Ariele's mom was with us, we stayed at a cute bed and breakfast in Forks. Remote worker ready? No. Very limited cell service. Overview: Our friend Jesse flew to Seattle to spend an epic week with us in the PNW. 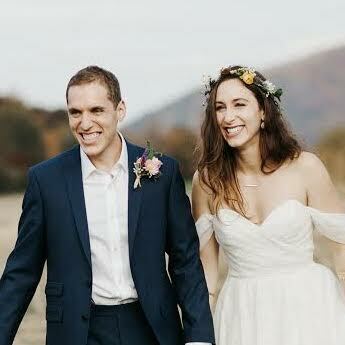 Our adventures began in Mt. Rainier where we experienced tons of snow, a very rainy hike, an epic waterfall, and a fantastic mystical campground. 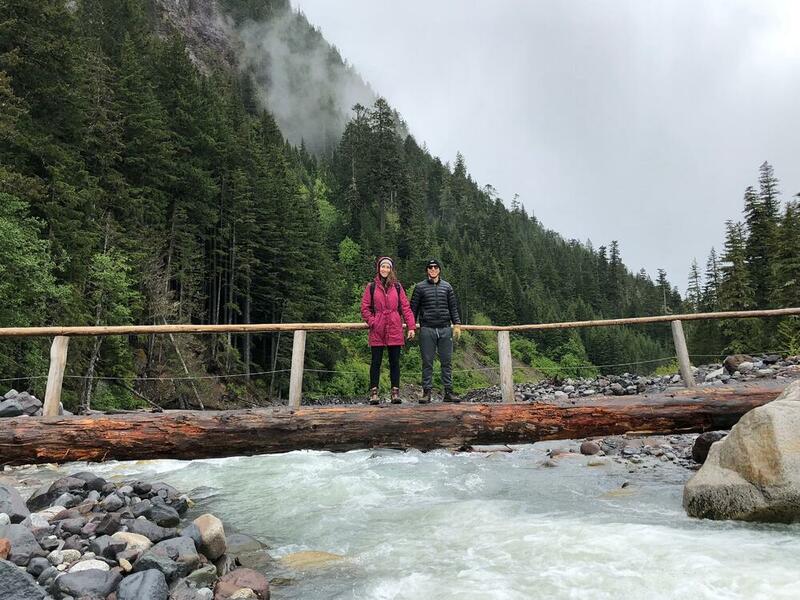 Hike the Wonderland Trail to Narada Falls. Drive up to the Paradise visitor center. In June, there was still many feet of snow on the ground and it was snowing. Find a clear view of the mountain! We never got to see it because it was shrouded the whole time we were there. 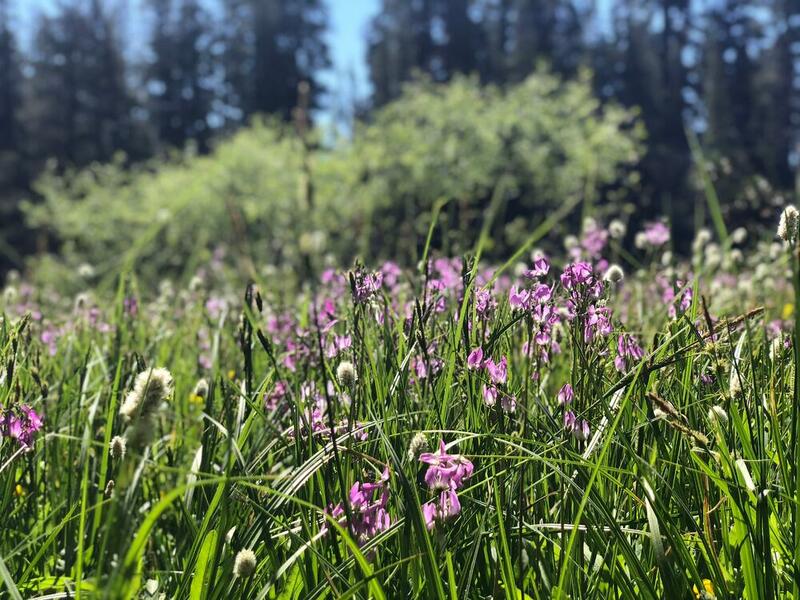 If you travel from Mount Rainier to Hood River directly through the Gifford Pinchot National Forest, make sure the road is open. 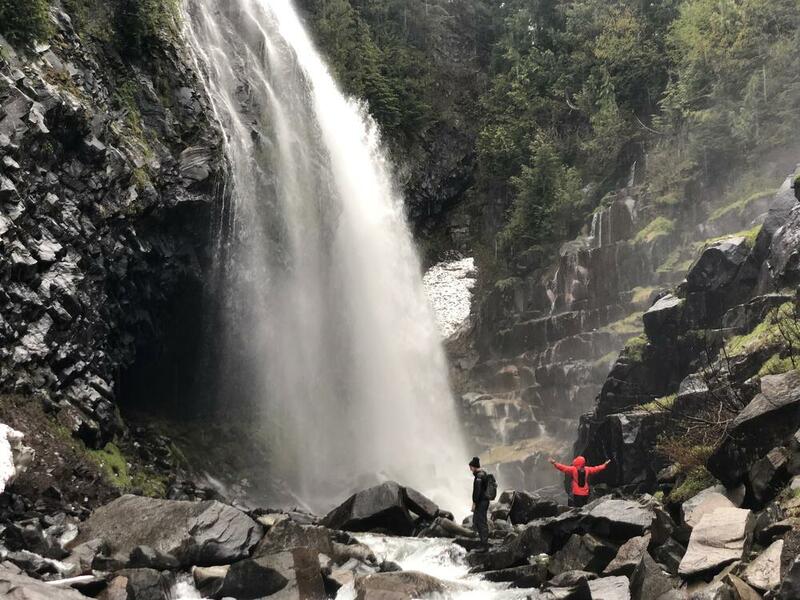 Then on your way over the mountain past St. Helens, stop hike down to Iron Creek Falls to get up and close with a private waterfall! Overview: We were heading to Hood River and came to a closed road. So, instead, we headed to the coast. 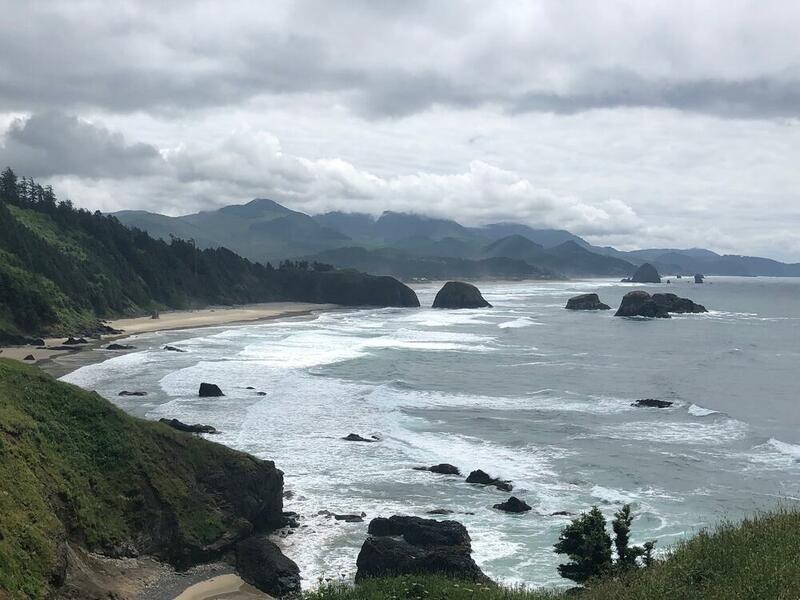 Keeping with the mystical theme, Oregon's majestic coast did not disappoint. Massive rock formations met the misty shoreline that Justin and Jesse so brazenly ran into, despite the frigid temperatures. At Ecola, make sure to drive to Indian Beach. And if you have time, hike along the coastline trail. Where we camped: Fort Stevens State Park. A bit crowded, many mosquitoes, but it served our purposes of needing full hookups for the night. Remote worker ready? Yes. Two to three-bar reception for Verizon. 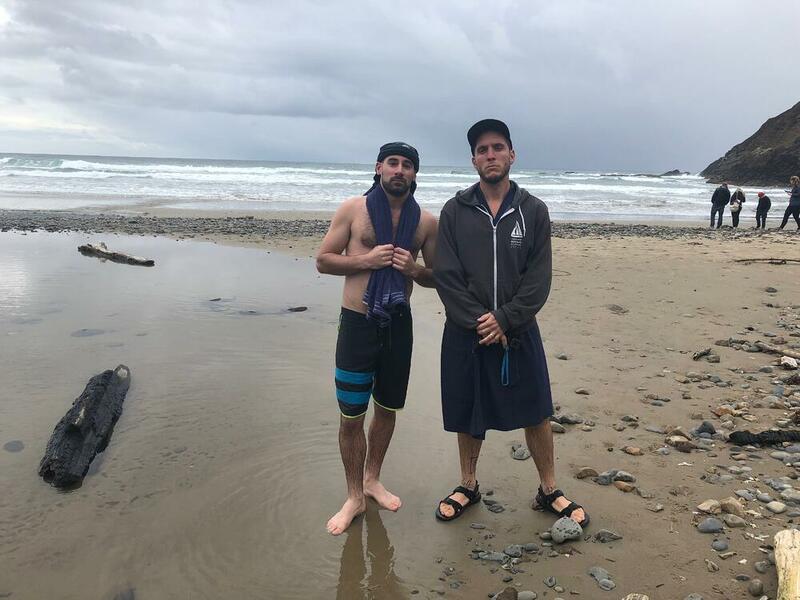 These fools running in when everyone else is wearing wetsuits. 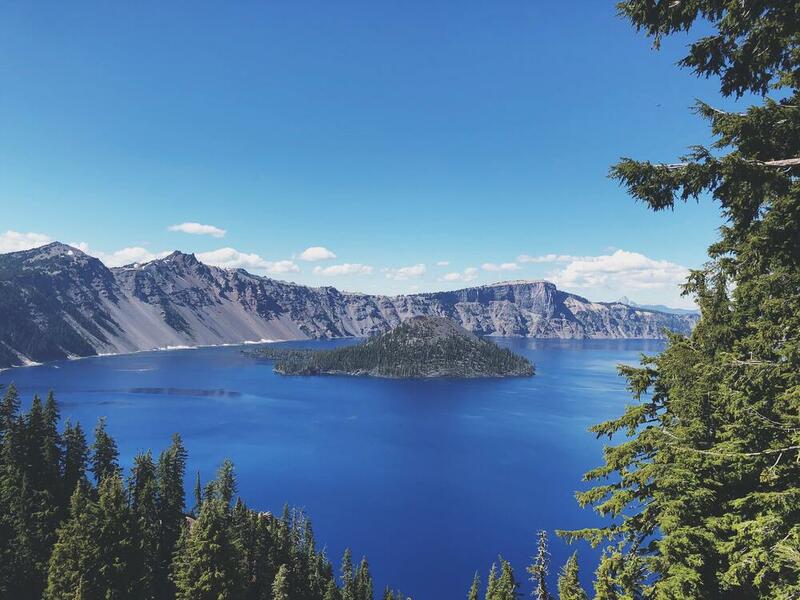 Overview: Our definition of a dream town, Hood River is nestled on the banks of the Columbia River just outside of Mount Hood National Forest. Cute shops, good restaurants, and fun bars and breweries so close to beautiful places to explore make it a place we would most definitely move (if it weren't so far from the east coast). Browse Oak Street and the surrounding blocks for outdoor gear, souvenirs, or trendy clothes. Check out the Goodwill Boutique store. Watch the wind surfers on the Columbia River. It did not seem like it, but Hood River is one of the windiest cities in the states, making it a perfect place for the sport. 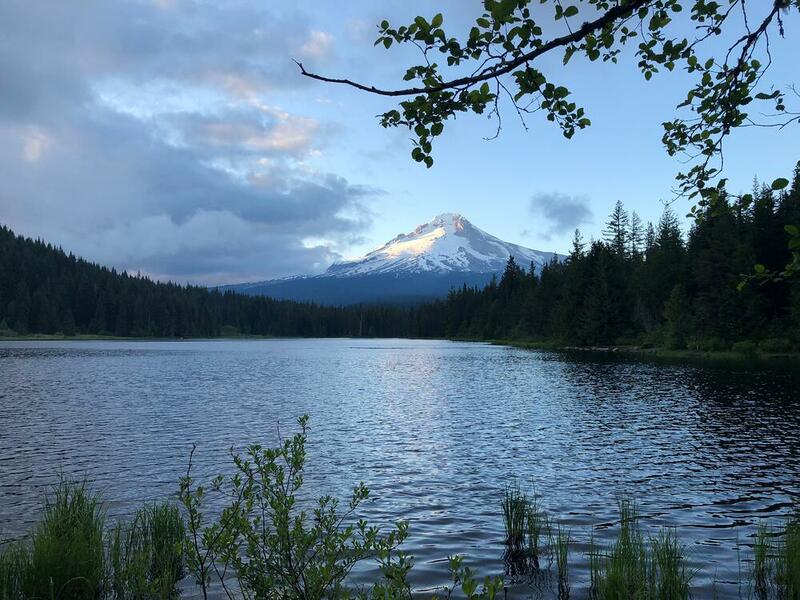 Drive into Mount Hood National Forest to camp and hike. This is why we were visiting, really. We could explore that national forest for weeks. The frequent view of towering, snowy Mount Hood as we drove was phenomenal. Where we camped: Trillium Lake campground near Government Camp (another cute town, much smaller). Remote worker ready? Yes, actually! We had one to two bars of Verizon cell service at the campground, but it was spotty throughout the forest. Overview: We spent a few days in Portland for one of Justin's in-person workshops. Ariele's favorite part was the amazing vintage shopping opportunities, so likely we'll be back, even if just for that! Check out Red Fox Vintage. One of many, this store was chock-full of amazing thrifted deals. Justin snapped up a Wrangler pearl snap. You can't go to Portland without going to Powell's City of Books. We have never seen a bookstore with so many books in our lives. It's a dream. Have an incredible dinner from start to finish at Trifecta Tavern. Where we camped: Camping World of Portland and in front of a friend's house on the street. 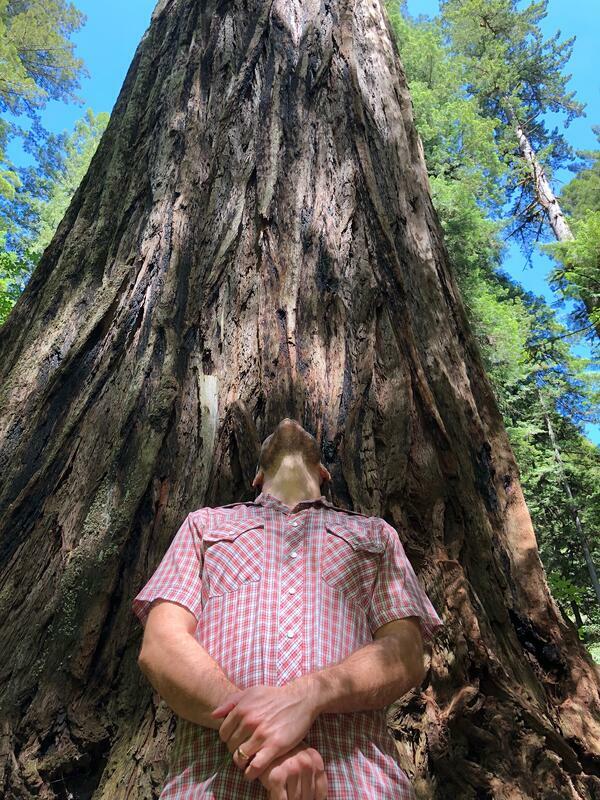 Overview: Seeing the redwood trees is like staring into the night sky and realizing how small you are, yet how connected everything is. 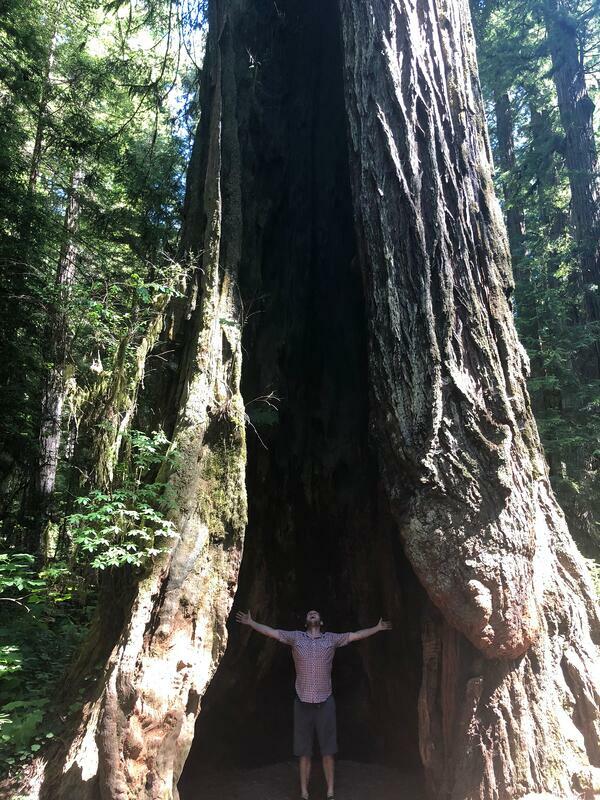 Many of the redwoods are thousands of years old and some nearly as wide as a car. 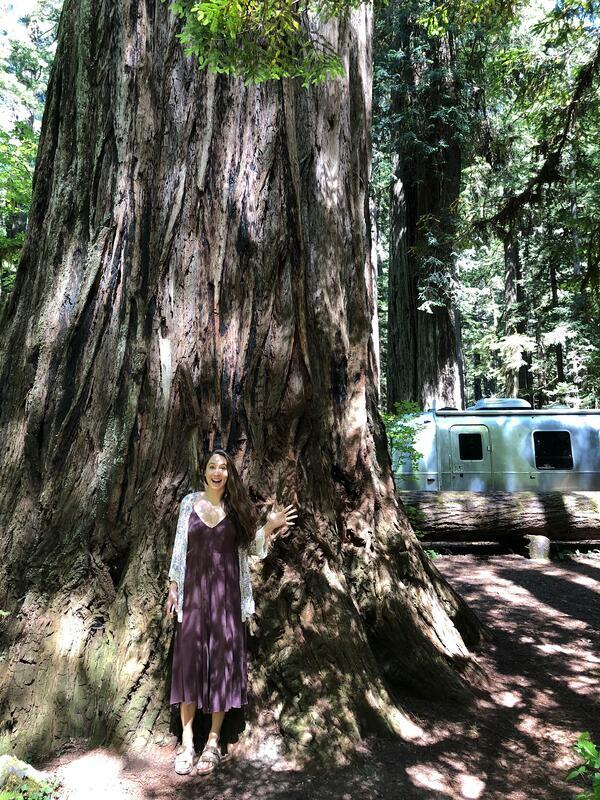 Start at Jedidiah Redwood State Park and drive down 101 all the way to the Avenue of the Giants in the Humboldt Redwood State Park. 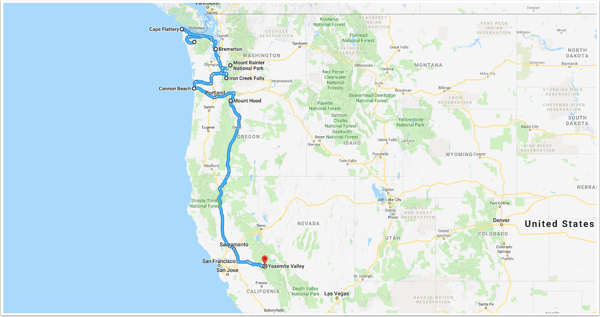 This passes through the Redwood National Park, as well. There are many places to stop and just walk among the trees, including a tree that has been burned, yet is still alive and you can walk into it, it's so big. Cher-Ae Heights Casino. This is actually a fantastic place to set up camp for a few days and explore the coast. They charge $20 to stay between one and three nights and that includes a water hookup. Right near Trinidad and Patrick's Point State Park, it's a great central location. Eat at The Lighthouse Grill in Trinidad. They offer range of delicious comfort food (including vegan), specializing in something called the mashed potato cone. Overview: We stopped here to check out the wine scene on our way to Sacramento. 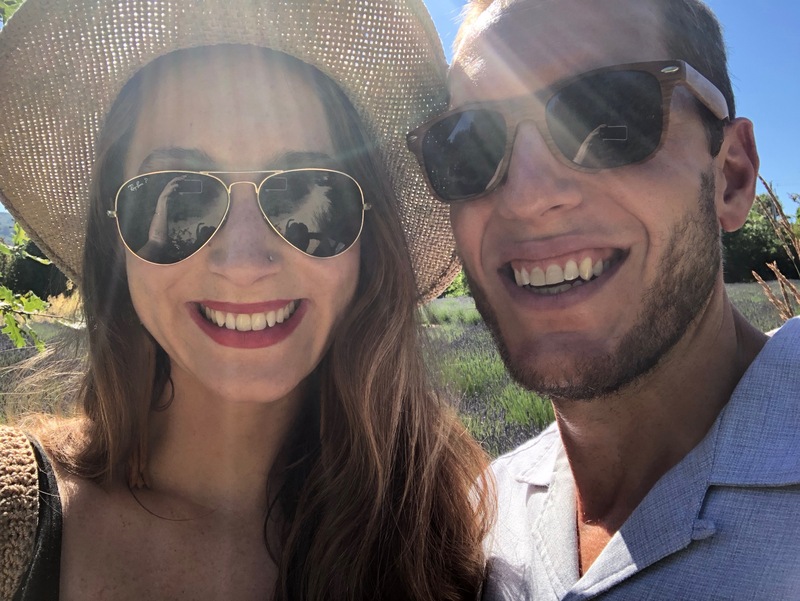 We went on a rare fancy date to a winery and dinner. Dating like this while traveling doesn't happen too often; I think it's because we are on average a 5 on the dirty scale all the time. It was HOT that day, so we were lucky to get into a campground with eletricity to blast our air conditioning. Matanzas Creek Winery. A tasting was $15 per person (though they only charged us for one) with generous pours and they let us try whatever else we wanted. 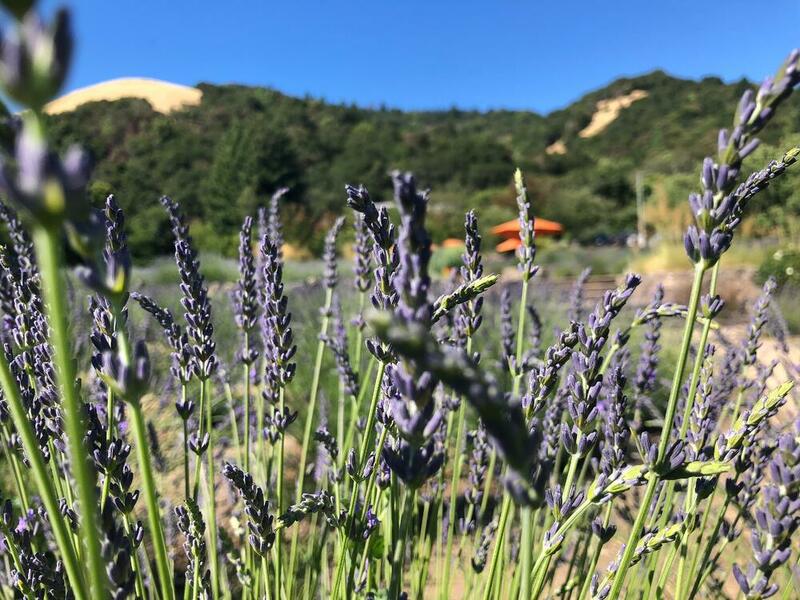 The biggest reason we chose this winery was for the blooming lavender fields! Eat at Ca'Bianca Italian restaurant. Delicious meal, from bread to entrees to dessert. Where we camped: The Sonoma County Fairgrounds. Overview: Justin's next workshop was in Sacramento. We wish we had more time to explore this city! From the mid-town area we were in, it seems artsy, fun, yet down to earth. Plus, it was really easy to park the truck and airstream for dinner. Eat at Hook and Ladder. Where we camped: Walmart in Roseville, CA. Not recommended, even though there were a few other campers. Pretty sure somebody was driving in circles around us to wake us up around 1 a.m.
Overview: We arrived pretty unprepared for what was definitely the busiest national park we've visited. We knew not having a campground reservation was risking it, but we are always willing to take a chance. 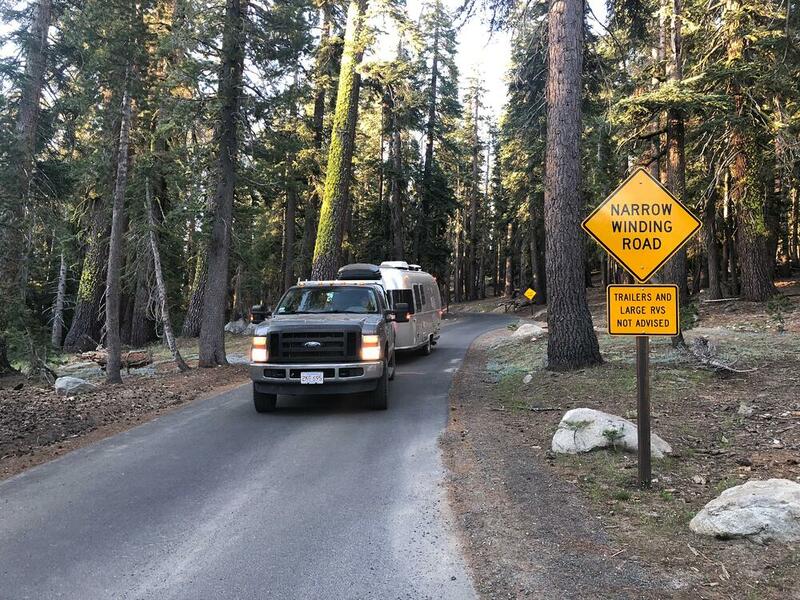 It turns out we arrived the day Yosemite Creek campground opened. We rushed there, down the narrow rough road "not advised for RVs" while nervously missing cars coming up the road. 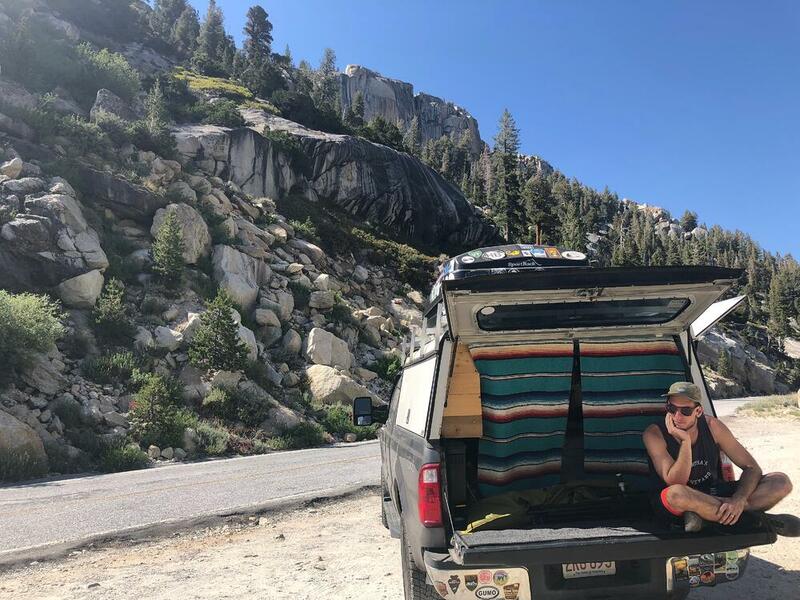 There were plenty of spots left, so we unhitched and drove the 45 minutes or so to the valley to see Half Dome, El Capitan, and Yosemite Falls. We fully intended to hike that day, but spent about an hour and a half just looking for a place to park with hoards of others doing the same thing. We ended up walking six miles that day, but it was around and to the visitor center. Oh, well. 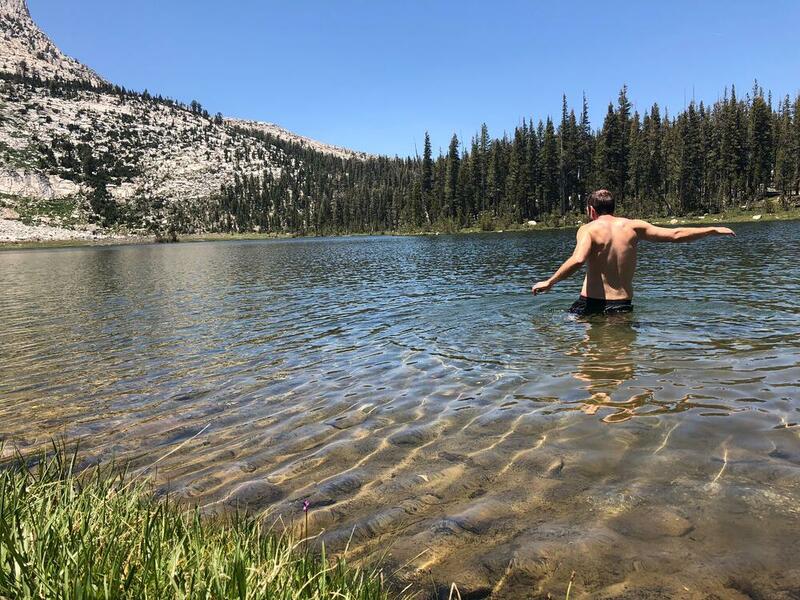 Saturday, we spent the day in Tuolumne Meadows, hiking up to Elizabeth Lake. We've never seen water to clear! 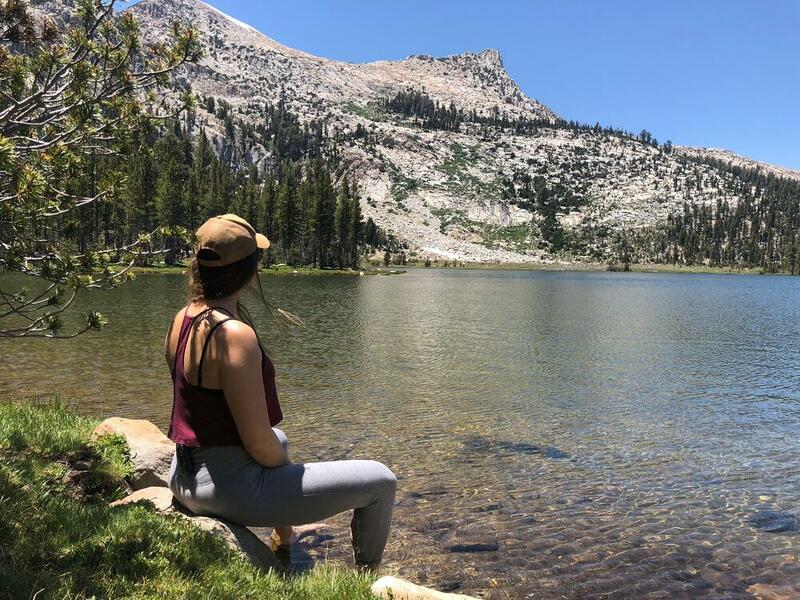 There is SO much beauty to behold and soak up in Yosemite National Park. We are so happy we spent two nights. But, we could spend weeks more. 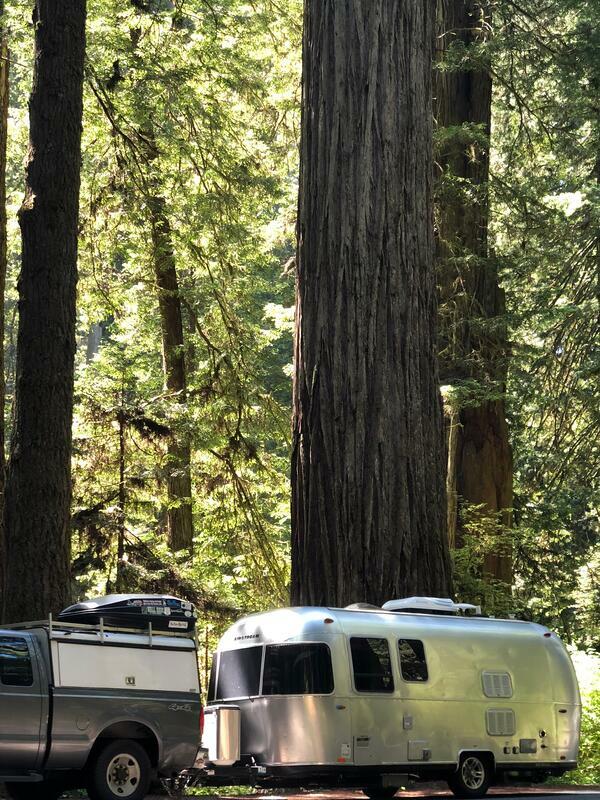 Unless you only want to spend the day, book your campground ahead of time in as far advance as you possibly can. Don't rely on the first-come-first-serve campgrounds because even late June, some at high elevation weren't open yet. Buy a full tank of gas before you arrive. It was $2/gallon more in this park. If you can, explore during the week. We still had an enjoyable time, but it was insanely packed on a summer weekend. Arrive to the valley early and take the free shuttle everywhere you want to go. If you really want to hike Half Dome, know you need to get a permit in advance. Ariele wasn't keen on the cable portion (especially going down), so we did not attempt to get one. Where we camped: Yosemite Creek Campground. We were okay getting our 22' long by 7' wide trailer down the road. There are very few spots to pull over, so when you come upon a car coming the opposite way, it's a game of maneuvering the narrow space. However, we made sure to leave before 6am on Sunday so we did not run into any cars on the way out. The road takes anywhere from 20 to 30 minutes to drive. Remote worker ready? No. Very limited cell service. The only cell service is in the valley and it's spotty. If there is water, he's in. These gloves have been one of the best buys we made for our trip. Justin enjoys adjusting the fire and used to do so with his bare hands, frequently singeing his arm hair. These gloves are heat resistant up to 662 degrees Fahrenheit and go most of the way up your forearms. 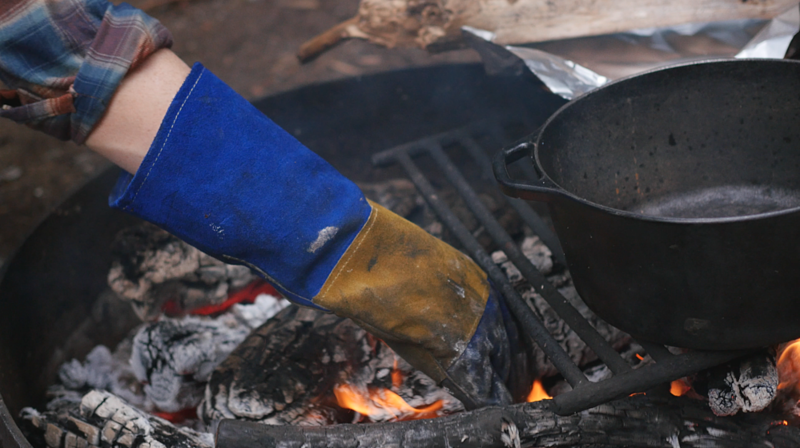 We use them mainly for maneuvering the logs in the fire, but also for cooking over the campfire and handling cast iron pans. This side dish is quick, easy, and actually makes broccoli crave-able. 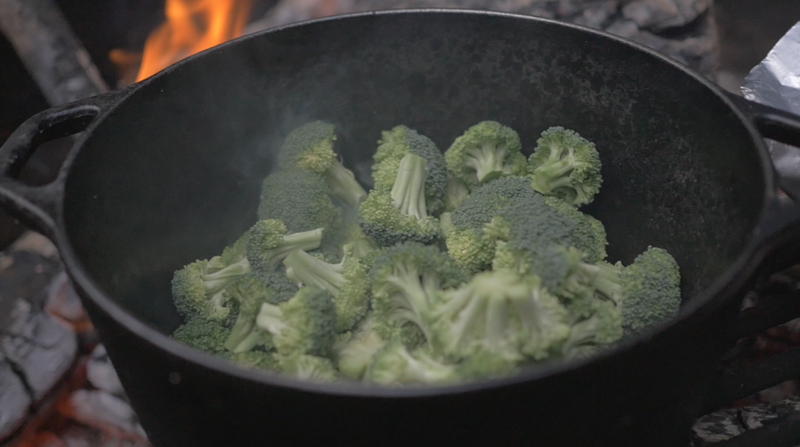 We cooked it over the campfire, giving it an added smokiness, but it can obviously also be cooked on a stove. Use a large iron skillet or iron dutch oven. We used our dutch oven because we were using our skillet for salmon. 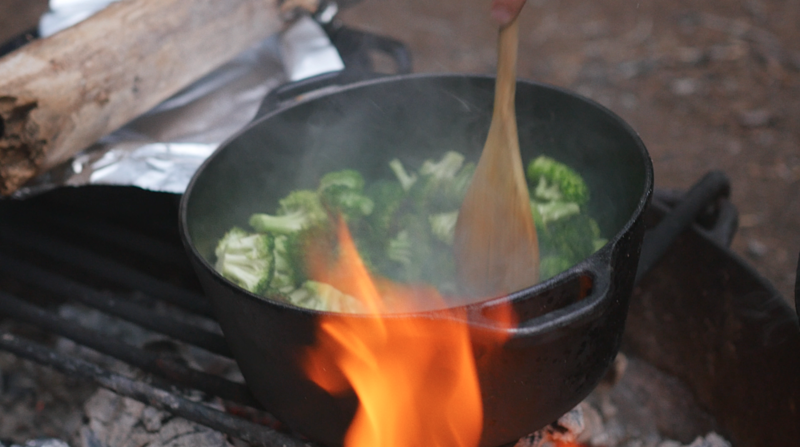 Over medium-high heat (I feel our campfires are generally this or even hotter), add the olive oil to the heated pan. 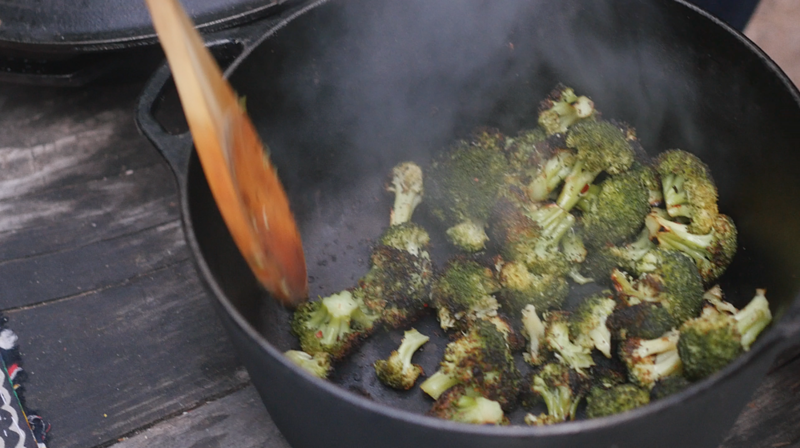 Once the olive oil has warmed up, throw in your broccoli, sprinkle with red pepper flakes (use sparingly) and cover with a lid. Stir the broccoli occasionally so you get a nice even black char. After about ten or so minutes, remove from the fire and serve immediately. Add a few dashes of coconut aminos for a semi-sweet and salty flavor.